Custom illustrations is a 2018 web design trend that’s captivating audiences everywhere. It’s very versatile and can be used for a number of things, from branding your website to explaining a concept. Use your illustrations effectively to enhance your blog articles. Drawings or artwork created specifically for your blog (“custom”) can be used to help your readers understand your message. A custom illustration placed in a blog article is a great way to clarify the topic, theory, or concept of your article. Additionally, a custom illustration may be your only option, if you cannot find a stock illustration that works with your article. 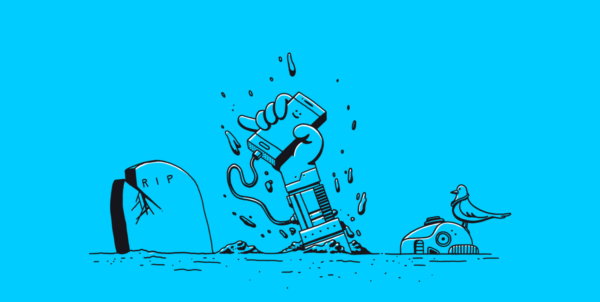 This illustration by Fernando Bittar is found on the UX Trends website. The Strategies website from Canada uses custom illustrations in its website design to support the topic of the website: the Strategies 2018 Resolution Challenge. 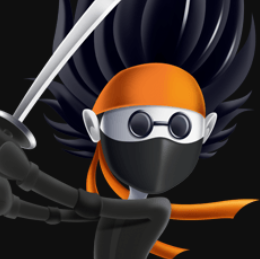 This website utilizes a lot of custom illustrations in its design. Colorful illustrations adorn the strategies.ca website. The website uses illustrations throughout the website to help readers understand the message of the site. In this case, the website promotes New Year’s Resolutions, and the custom illustrations create a visual element that mirrors the content. It’s easy to use an illustration to reinforce your company’s brand image, and people enjoy it! Your website visitors want to understand what your company is all about, and a custom illustration can help them do just that. This online retailer uses adorable custom illustrations to visually demonstrate its brand image: soft, cozy, gentle, inviting. The custom illustrations are all white against a peachy-pink background. The button is a gentle, dense mint green. This website uses simple illustrations to enhance its image. Overall, the illustrations add to the friendly, comfortable personality of the brand and website. When choosing illustrations for your website, be sure to keep your brand’s identity, voice, and message in mind. Think illustrations should be saved for “fun” or “artsy” websites? Think again! The Europejski, a luxury hotel in Poland, uses custom illustrations to strengthen its brand image. These illustrations are highly detailed, soft, and utterly elegant. The Europejski’s design is very different from Buffy’s design (above). Both websites use custom illustrations that add to the company’s brand identity, but the execution is very different. The custom illustrations used on this website are elegant, sophisticated, and thoughtful. Even if your company is “serious,” you can still use custom illustrations to enhance your brand. People like illustrations because they’re interesting. Illustrations can be used very effectively to get the attention of your website visitors and to keep them engaged while they browse your website. Getting attention with an illustration is probably one of the easier ways to use them. However, remember that the illustration must make sense in the context that it’s used, or it won’t really resonate with people. Also, it should support the overall look and feel of your brand identity. Another website that uses custom illustrations in its design is The Trading Game. This is a game created by Finance Illustrated to help users learn about stocks and trading. The illustration are animated, and effectively reinforce the brand identity. In addition, the colorful, moving illustrations capture the attention of the target audience for this company. Animated custom illustrations capture interest immediately. Although no longer online, the creative landing page for Van’s sneakers utilized illustrations to garner the attention of its target audience. Van’s website used custom illustrations on its Holiday Gift Guide landing page to grab attention. Illustration is an art form. That means you can use it to add appeal and beauty to your website design. It doesn’t matter what your website is about, or how “professional” your company is – custom illustrations are an excellent way to make your website more visually attractive. This website design, from a company in Germany, uses white custom illustrations on its landing page that are visually appealing. Black and white – so simple, yet so effectively used here with an eye-catching illustration. Additional illustrations on the website are gentle on the eye. The illustrations are wonderful and very enjoyable for website visitors. This colorful, detailed illustration is lovely to look at. The illustration also creates the “mood” of the website – funky, fun, innovative, and magical. Our favorite custom illustration to use on our website is, of course, Arty! 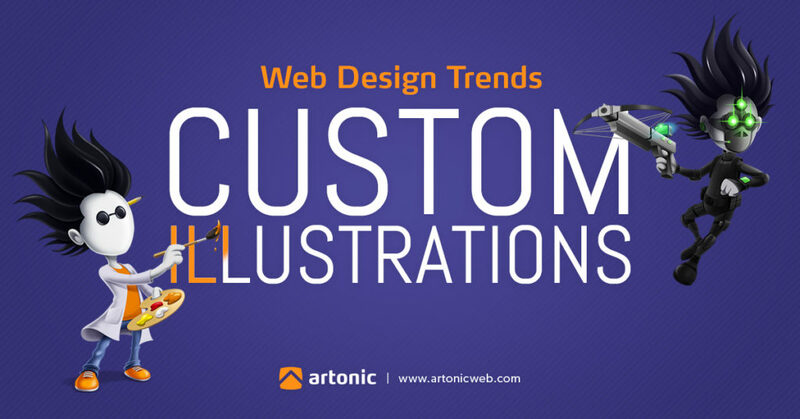 Custom illustrations are used on Artonic’s homepage. 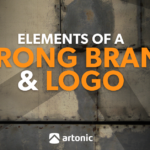 Throughout our website, Artonic also employs the use of simple animations to enhance our content. Interested in Custom Web Design? What are your goals for the website? Bring in more leads? Convert more leads into sales? Increase market size? 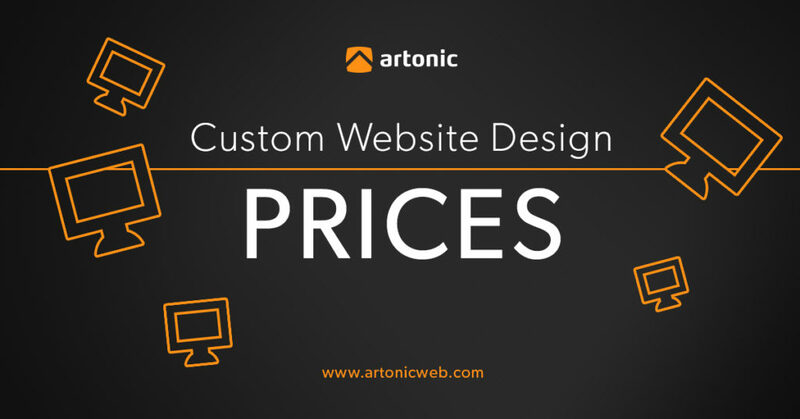 Cost definitely varies depending on the difficulty and complexity of your website goals. SIZE: HOW BIG IS YOUR WEBSITE? How big is your website? What is the scope and scale of your project? Specific pages are important for SEO, Inbound Marketing, Google AdWords, and usability. Do you have enough pages to reach your goals? Do you need something that’s outside a basic website? Maybe you need a custom backend, or advanced filtering systems. Functionality costs vary depending on what you want your website to do.